Sami says that my dog, Taff, has personal hygiene habits that are similar to mine. He often looks unkempt (as do I), but I'm a bit insulted by the insinuation. I've never (purposely) rolled in manure (cow or sheep), and I have a distinct dislike for burrs. Today, Taff helped return a group of wayward sheep to their pasture in Rocklin. They'd been chased (probably by a coyote) through the electric fence - Taff and I (and Lara's dog, Mo) gathered the last bunch and put them back where they belonged (our apprentice, Paul Lambertson, along with his dog Ben, had gathered most of the flock). During the work, Taff picked up a few burrs. After this adventure, Taff and I went to the Canyonview Preserve, a property owned by the Placer Land Trust. There wasn't a great deal of work for Taff, but he managed to find even more burrs! Our friend Jean Allender calls these burrs "beggar's lice" - I like the term and the imagery. As a shepherd, I'm too poor to have real lice, but I certainly have beggar's lice! But the beggar's lice weren't enough. After helping me move the lambs at Elster Ranch this afternoon, Taff found the biggest, greenest pile of runny sheep manure on the property! 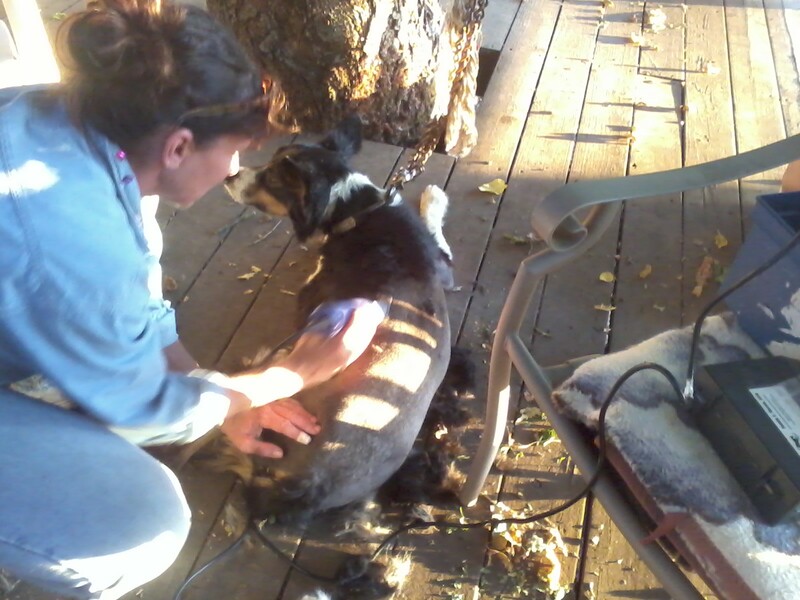 Even after hosing him off, he gave off an odor (and an aura) of sheep poop! Tonight, Sami is giving him his second summer haircut. Border collies are so smart - I secretly suspect him of rolling in the manure and running through the burrs to force us to clip him. He'll be much cooler after his trip to the barber, and much cleaner after I give him a bath! Even border collies enjoy a trip to the day spa! By the way, Sami's giving me a haircut tonight, too - not sure what that says about me!